how many Bostonians of 1773 were inconvenienced and incensed that they couldn’t have a cup a tea because some leftist radicals had dumped the last shipment into the harbor as part of an ideological argument against british taxation? how many good moral citizens of Birmingham in 1963 were put-out because the protests of “uppity-negroes” kept them from shopping in their favorite stores and eating at some of the best lunch counters in town. Why was I thinking about these historical events? Because I know people who were sitting in their cars trying to get to work or home, a sporting event or a party were NOT happy, YET I also know great American protests have often involved inconveniencing the masses to raise awareness of injustices. The truth is most of us, if not personally impacted by a social issue, will not get involved in seeking political and social changes. For example, segregated seating on busses and in public establishments did not negatively impact the majority; but the protest that brought inconvenience to the masses also brought increased awareness and sped up remedial action on the part of the elected officials. The majority of Minnesotans believe that the “policeman is your friend”, this is how we (European-Americans) are raised and this is the how we usually encounter the police. However I also know from living over 27 years in a predominately African-American community that my experience with the police is not normative for most black persons. I have witnessed over and over actions by police in my North Minneapolis community that would never be accepted in Plymouth or Woodbury. I have personally witnessed, and heard first hand accounts, that make my blood boil. Accounts of overt racism, blatant disrespect, threats and actual violence perpetrated by the police. BUT…. most Minnesotans do not believe this is the case, most political officials do not believe the problem is that bad and have not begin to think otherwise. So last night my neighbors, and friends were in those numbers, wanted to bring a little of our daily frustration, irritation, inconvenience, and even the dangers, this climate of policing puts on our community to the broader community. Perhaps sitting in cars waiting for traffic to begin to move someone was able, in a small way, empathize with the black mother who sits at home and worries that her brown skinned son will be stopped and harassed by the police. Perhaps someone was forced to think about how negative police / community relationships are in Minneapolis and want to see change begin ASAP. 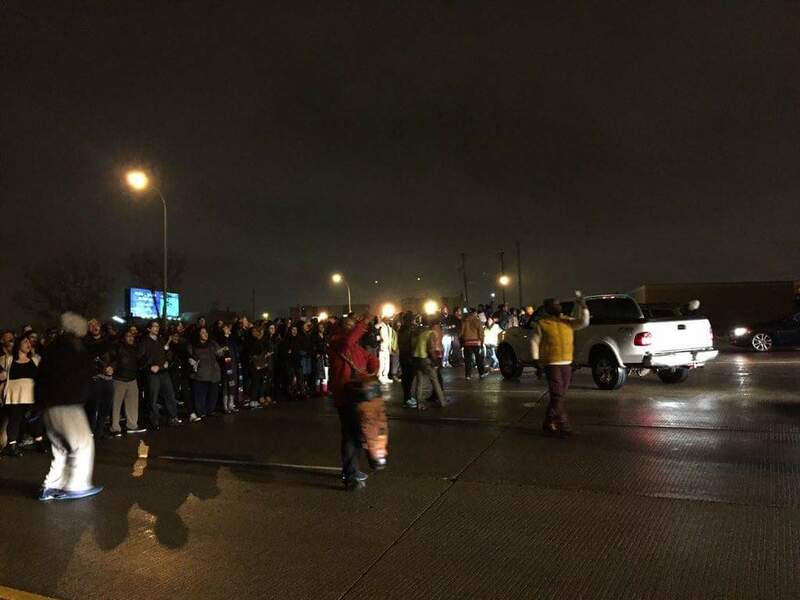 Perhaps the broader community will begin to see the problem did not begin with the shooting of Jamar Clark but with a system that fails to see the humanity of all residents.